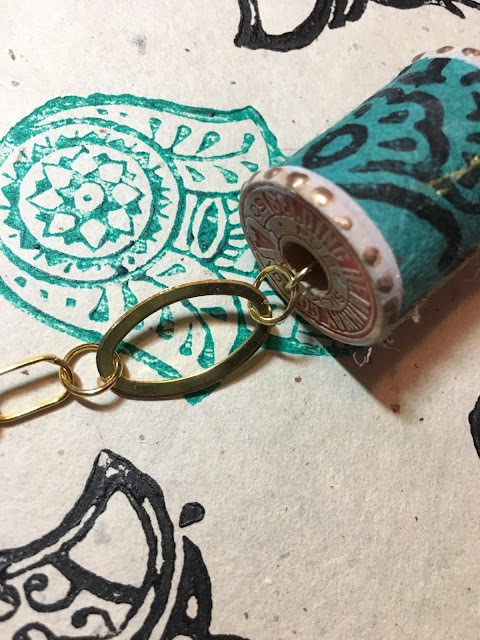 A reversible boho necklace to wear with more things than you would at first imagine. I’ve always wanted a statement piece like this one. What a surprise to me that it was easy and well within my reach to make myself. I know you can make one too. If you do, send me a note to let me know where you are sharing it so I can check you out. I knew before I started to assemble this necklace that I wanted a variety of paper with the images of Gwen’s stencils. I print on reclaimed paper from gifts, packing and shopping. Most of this batch was printed on pharmacy bag paper. 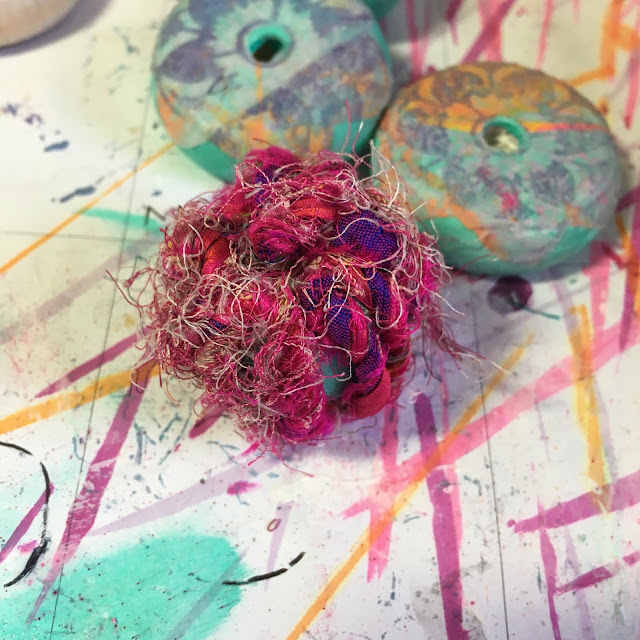 I could have prepared them in a variety of ways – using a spray ink, pouncing paint upon the stencil or using artist marker. 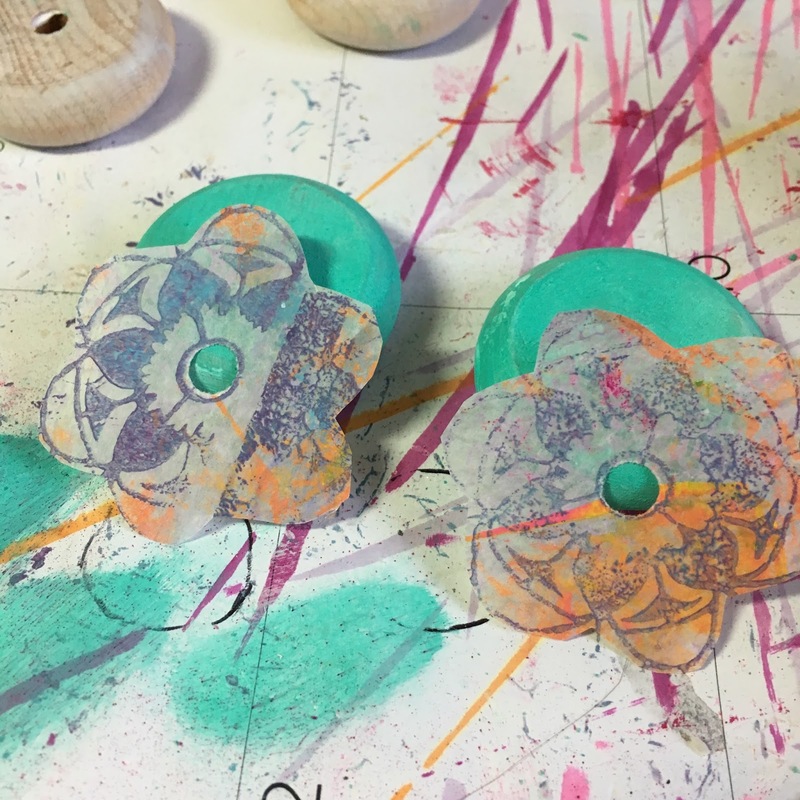 I chose the inexact and very flowy look of gelli plate printing. I simply love the process. So much loveliness to work with. As you can see, I only use a tiny bit of it, so I have plenty left for other projects!!! The wooden tag – I purchased mine at Michael’s. 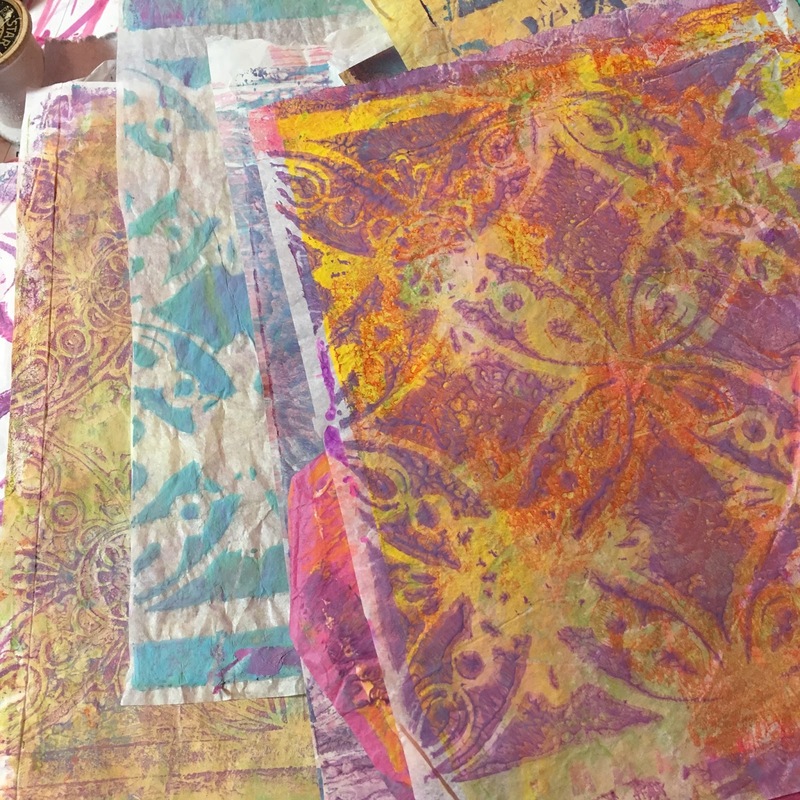 A piece of gelli printed paper for each side. Using a separate print for each side makes it reversible. A piece of mirrored trim from Gwen’s shop. A handprinted sliver of mulberry paper saved from other projects. This came in one of Gwen’s paper packages. Gel medium to adhere the pieces. 1. 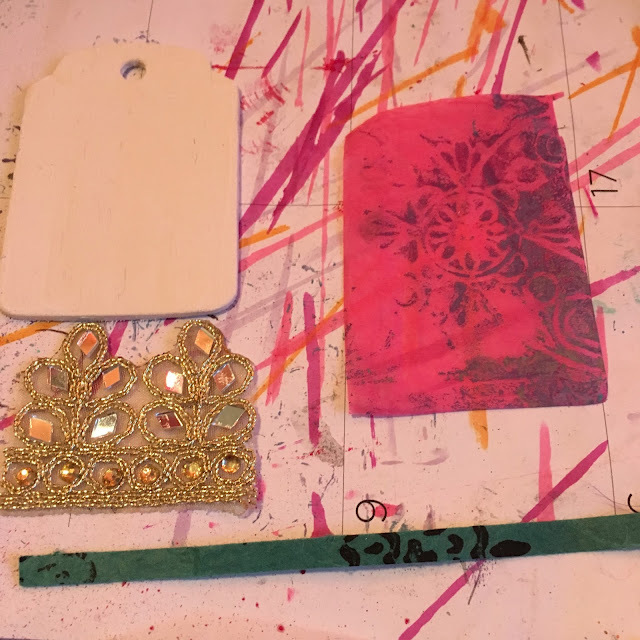 Adhere the gelli print to the tag with gel medium. 2. Adhere the sliver of mulberry paper with gel medium. 3. Adhere the trim with gel medium. 4. Flip and do the other side. 5. Coat the sides with the liquid pearls. Coat 3/4 of the way around. Let dry. Turn and coat the rest of the edge. 1. 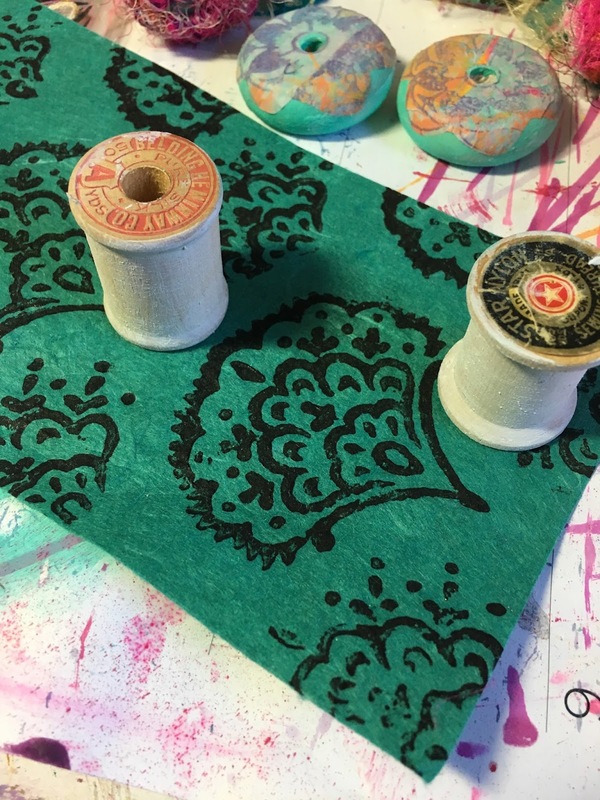 Adhere turquoise and white stenciled paper. 2. Cut a piece of trim two flourishes long. Trim off the bottom section for this piece and put the flourishes aside for later. 3. 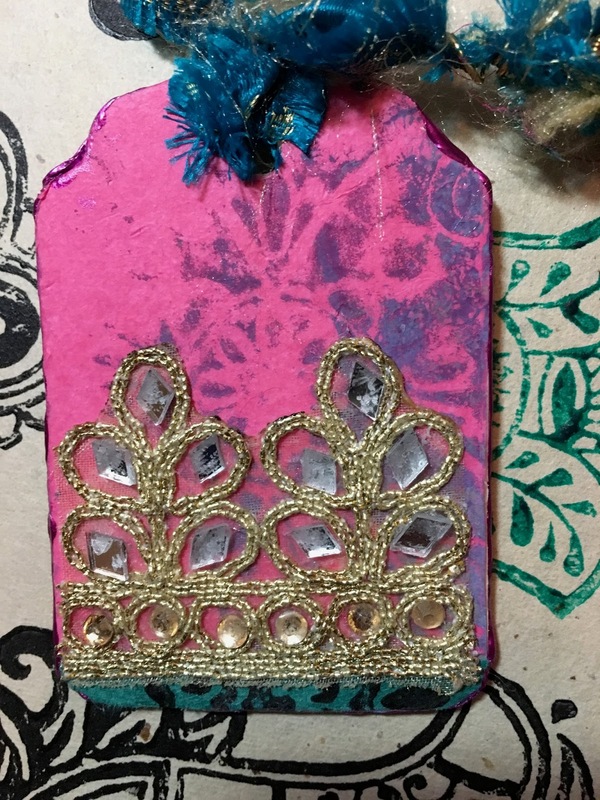 Using Ranger’s Liquid Pearls add embellishment to the tag. 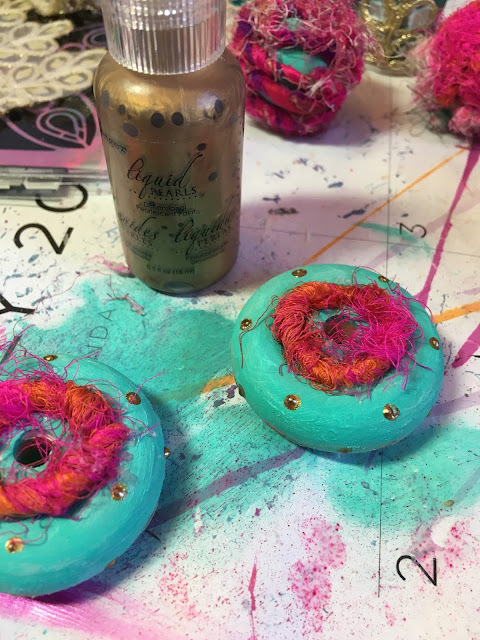 After priming them with gesso, they were painted with aqua acrylic paint. The stencils were trimmed to fit the wooden wheels. Adhere with gel medium. Cover with a layer of gel medium. Love these colors together. The beads were flipped over and the glue gun was heated up. 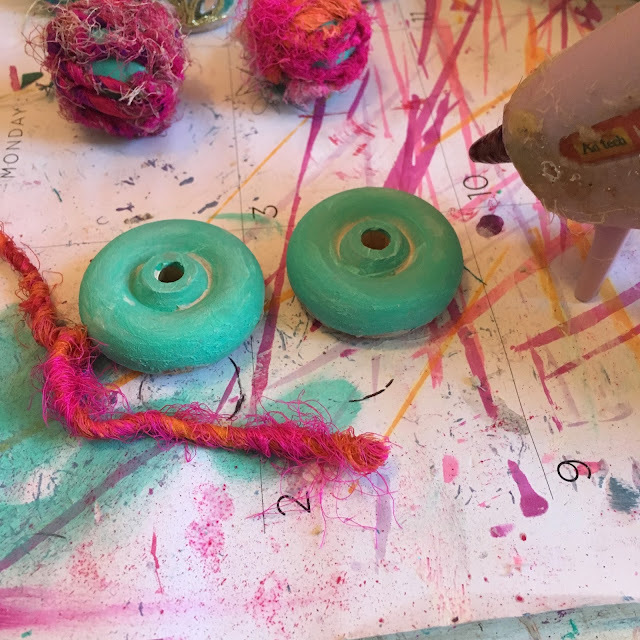 Sari yarn was glued to the indentation in the wheels. They still looked a bit bare, so dots of Ranger Liquid Pearls were added. 1. 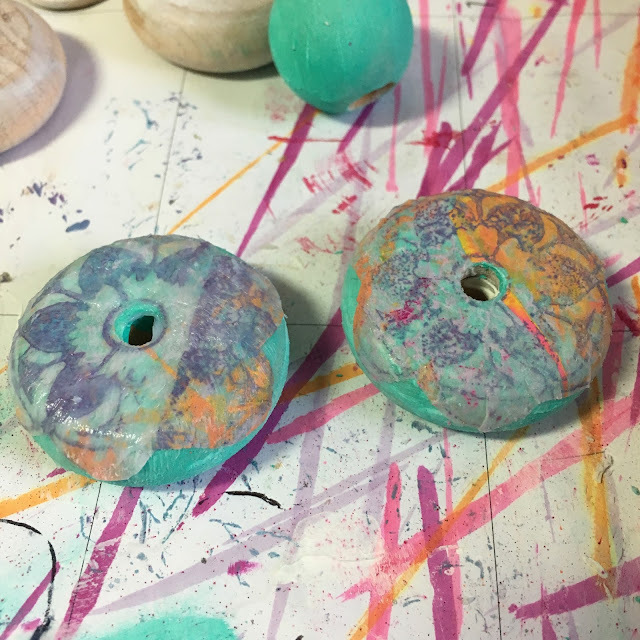 Cover wooden bead with gesso and then paint the desired color. 2. Thread a needle with like-colored thread. 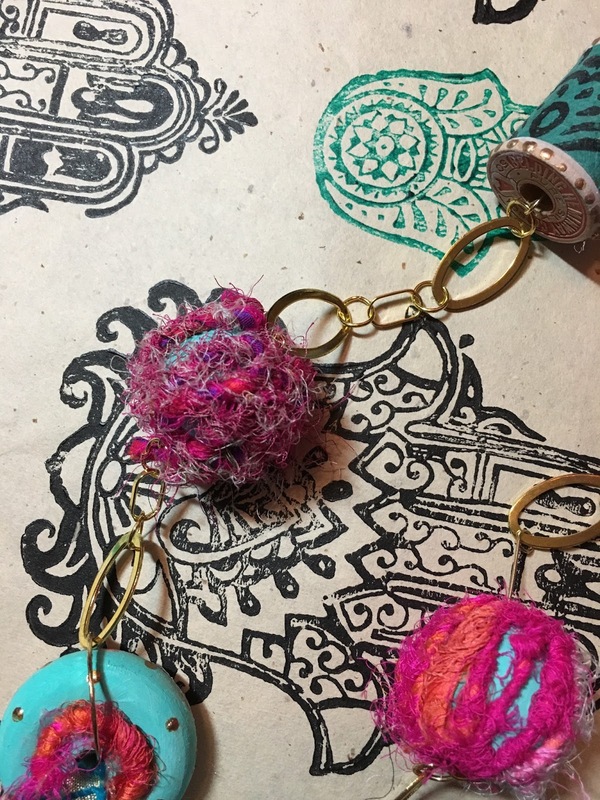 Take a stitch at the end of the sari yarn. Pull the needle through the bead. 3. Pull sari yarn up to the opening and stitch through. Pull the needle back down through the hole. 4. 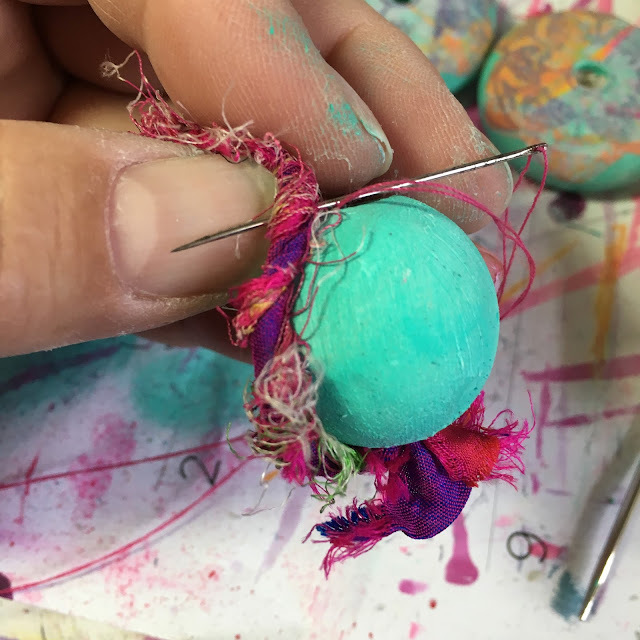 Pull the sari yarn back down to the bottom and take a stitch through. 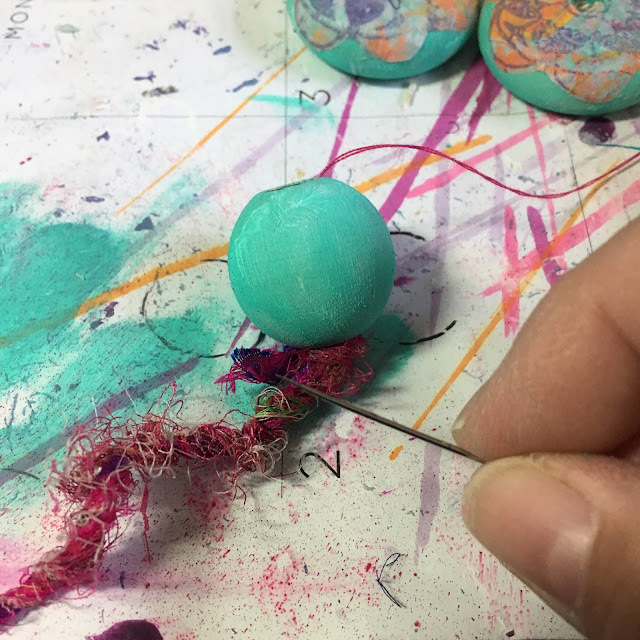 Continue this process until the bead is covered with sari thread. Leaving some space for the color to peek through adds vivacity. 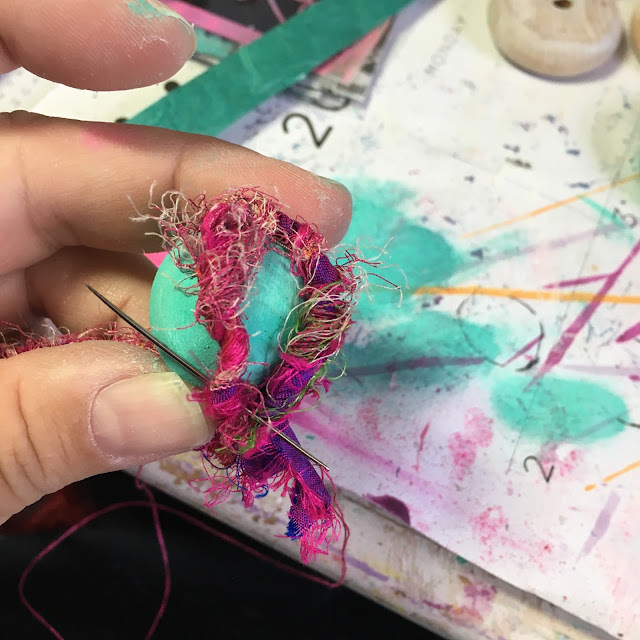 When the bead is covered to your liking take several stitches through the end of the sari yarn and trim. Eventually, you will use a jewelry wire to thread through the bead to attach to the chain. 2. Cut the paper the width of the spool. 3. Adhere paper to spool with gel medium. 4. 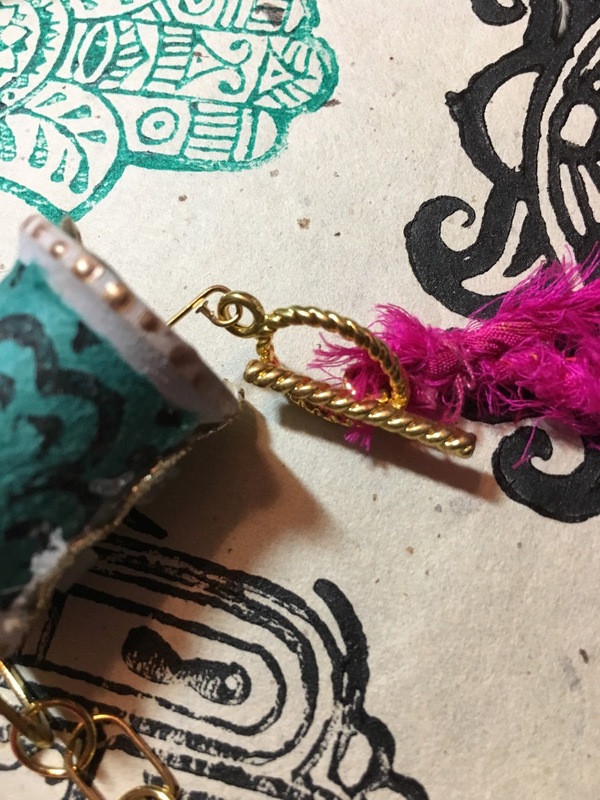 Add one flourish from the trim (left from a previous step) to each spool to cover the seam. 5. Add embellishment using Ranger’s Liquid Pearls – Gold Pearl. 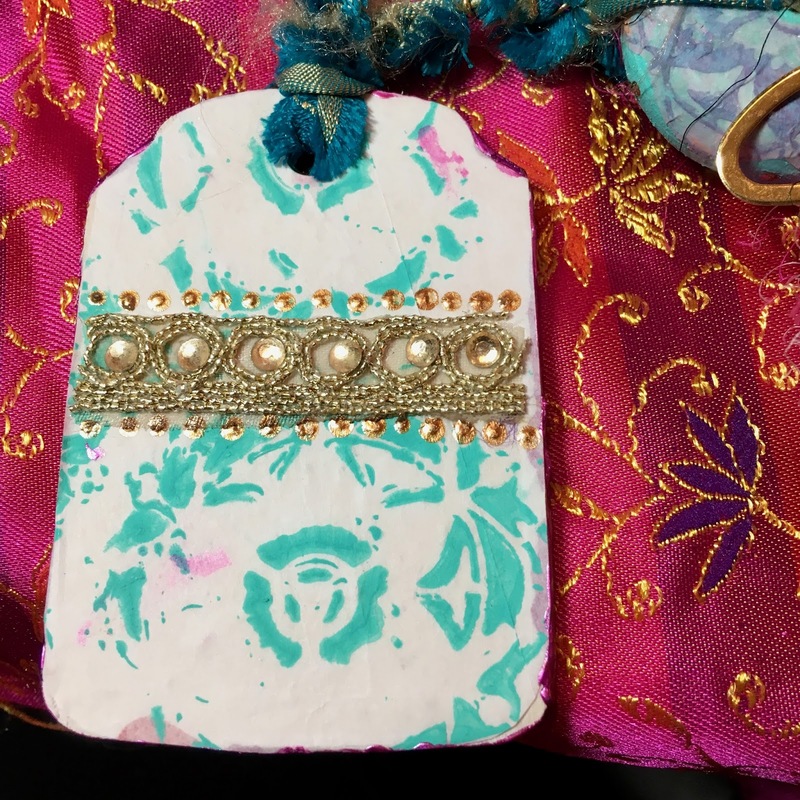 An old piece of sari fabric was the perfect color, so that became the hanger for the tag. A piece of sari yarn was used as the back of the neck. 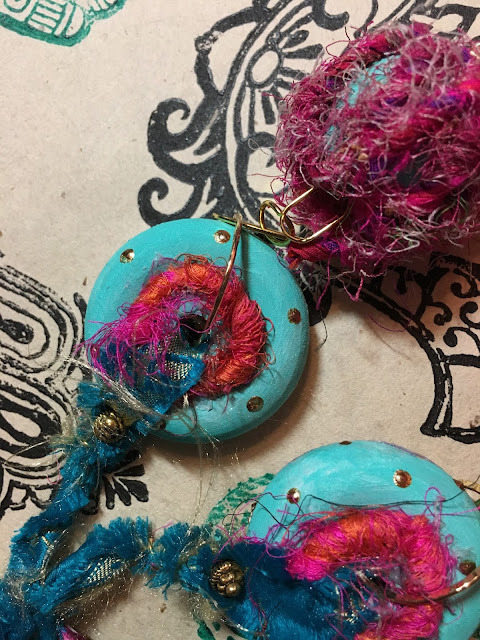 The rest of the components were put together with traditional jewelry materials including some chunky chain pieces that had been looking for a purpose for many years. Not only do I love how you covered those beads, I just adore the pictures of you! 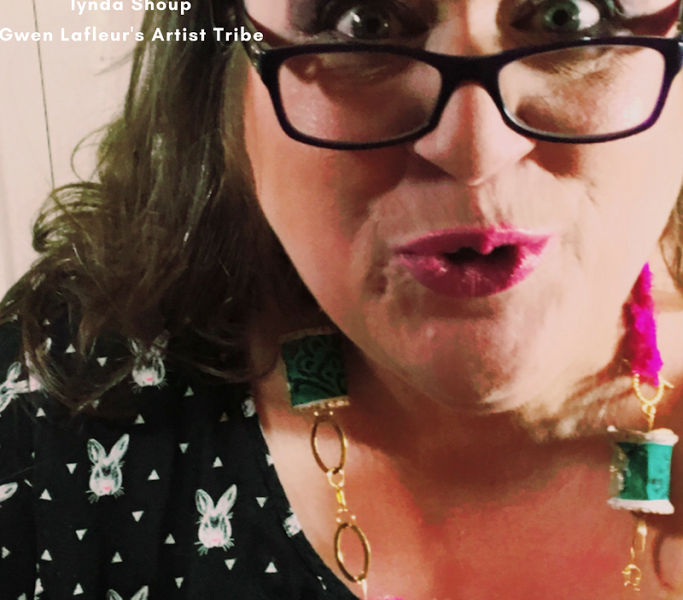 This is so cool Lynda! 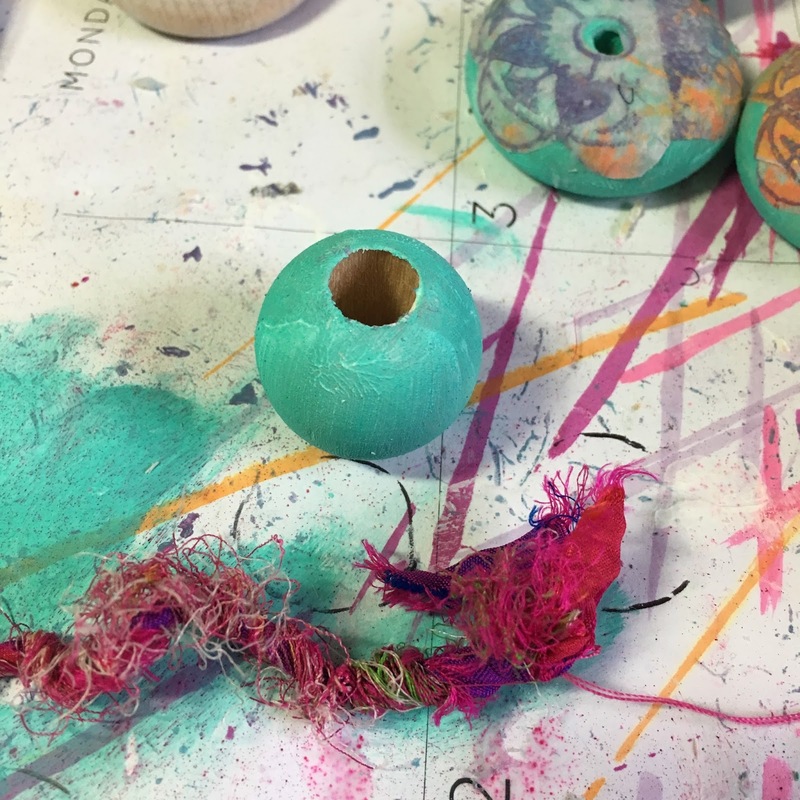 I love all of the upcycled elements and the way that you used the gelli printed paper, trims, and other papers to make your own beads! Such an awesome necklace! Thanks, Gwen! There are so many possibilities. I actually had to stop myself from adding more detail as it would have become pretty busy. Guess I'm just going to have to make some more to manifest all the ideas I had. Sandee, you are such a dear! My daughter offered to do my hair and makeup and have a photoshoot. I'm a goofball so you can imagine how fun the outtakes are! I had such fun making the necklace, but then we had so much fun documenting it. Jill, it was so fun! 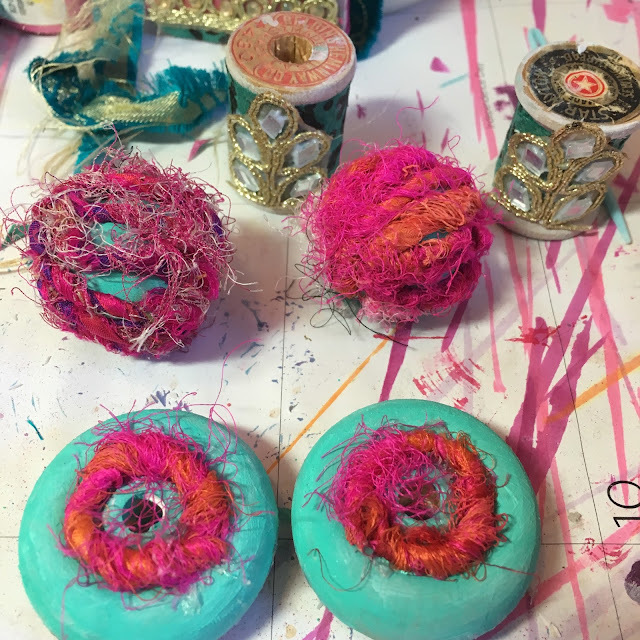 Can't wait to see what you make with your stash. I'm glad you think being a goofball suits me as it is a bit late in the game for me to change. Beautiful necklace. I love your color choices and those amazing trims! Thank you for sharing your process. Looks like fun! Thank you Kate! Thanks for taking a peek. It was so much fun to make this. Glad that you like it. The trims really are great. 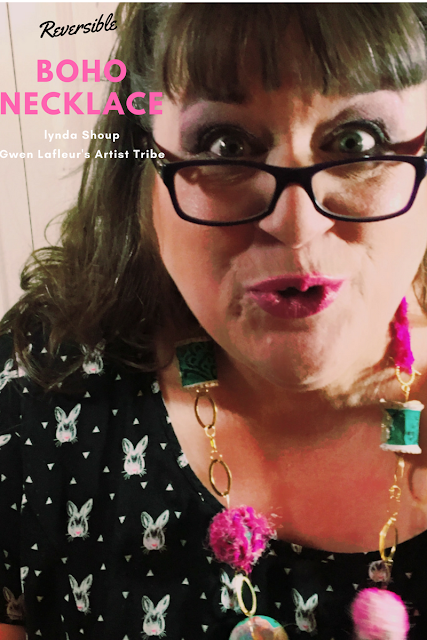 Working with Gwen Lafleur's products is sheer joy. Lynda! This is out of the box extraordinary!! You are so very very clever!! What a cool way to use those trim and those beads you covered with Sari- WOWS! You and your creativity just amaze me my tribe sister!! Bravo! Same back at you, Jackie! You amaze me too! Glad you like the necklace. It was fun to make and I hope to have fun wearing it.